Here is a fact that should alarm you: Of 180 cities monitored for air pollutants SO2, NO2 and PM10 in 2010, only two towns Malapuram and Pathanamthitta in Kerala met the criteria of low pollution (50% below the standard) for all pollutants, according to the Centre for Science and Environment (CSE). SO2 and NO2 are noxious gases while PM10 is particulate matter such as dust and smoke particles. The number of critically polluted cities (1.5 times the standard) increased from 49 to 89 between 2005 and 2010. This is only one dimension of multiple environmental challenges that India must address. India is home to 18% of world population, 15% livestock population and 7-8% of all recorded species.But we have only 2.4% of land area in the world. This puts an immense pressure on all natural features: air, land, water, animals, vegetation. “India cannot afford to follow the West's development model of resource and energy-intensive growth and lifestyle. The country's natural resource base cannot sustain such a growth model for all and there will be huge inequalities and social conflicts. We need a developmental model that puts premium on social welfare and not on resourceintensive growth,“ stresses Chandra Bhushan of CSE. Take water, for instance. Raw sewage and industrial waste has rendered water in more than half of India's 445 rivers unfit for drinking, according to the Central Pollution Control Board.Water from at least a quarter of the rivers surveyed can't even be used for bathing. Why is this so? 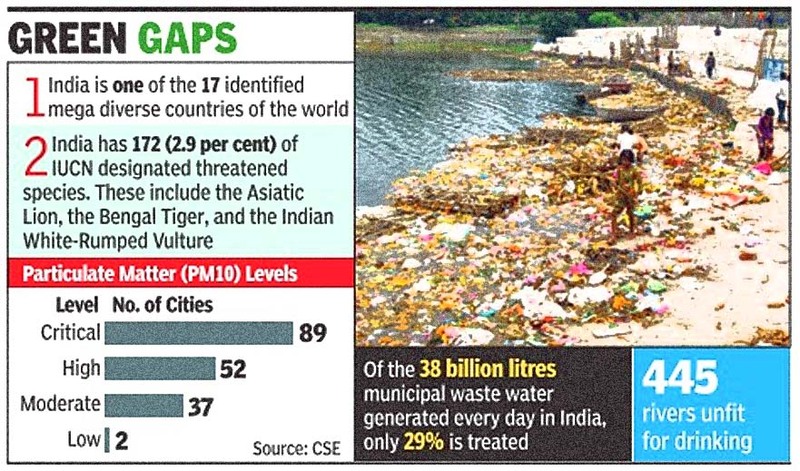 Of the 38 billion litres municipal waste water generated every day in India, only 29% is treated.By 2050, 100 billion litres may come from Indian cities each day, it said. Another aspect of water mismanagement is the fall in India's per capita freshwater resources from 6,042 cubic metres in 1947 to 1,845 cubic metres in 2007. Indian cities are using 50 billion litres of municipal water a day. While forest cover -estimated at 24% of geographical area -is not de pleting, it is still short of the target of 33% set in 1988.But there are clear warning signs: moderately dense moderately dense forests, which hold the future growth of forests, declined by 1991 sq km between 2011 and 2013, according to the most recent Forest Survey of India report.In 24% of forests there is `inadequate' regeneration; in 10% none at all. A dangerous 73% of forest area is affected by light to heavy grazing by animals. Environmental governance -from local to the national level -needs an overhaul, feels Chandra Bhushan. Our laws, regulations, regulatory institutions etc are not suitable to deliver environmentally sound development in the 21st century, he says. “The present governance system is top heavy, piecemeal, unaccountable and opaque. It has failed to involve people, communities, local governments and companies in solving the environmental problems,“ he added. Environmental degradation is often directly a cause for severe economic loss, and perpetuation of poverty . In India, more than 147 million hectares soil has become degraded, eroded and thus unproductive. About 5334 million tons of topsoil is lost annually . According to G Mythili, professor at the Indira Gandhi Institute of Development Research, production loss due to land degradation t is, 13.4 million tons. in 2010 was 16%, that is, 13.4 million tons.That works out to about Rs 162 billion. Essential cereals make up 66% of this loss. All these environmental challenges are going to get aggravated in the coming decades because of climate change.It will make the poor poorer and wipe out whatever development has taken place, argues Bhushan. “Indians will have to start adapting to climate change. Simultaneously , we have to start reducing greenhouse gas emissions and work with the global community to limit the rise in the global temperature below 1.5 degrees C,“ he added.